Today, the scientific journal Nature released what could amount as the most important astronomical discovery of the century. Scientists confirm an Earth-like planet orbits the closest star to our Sun. 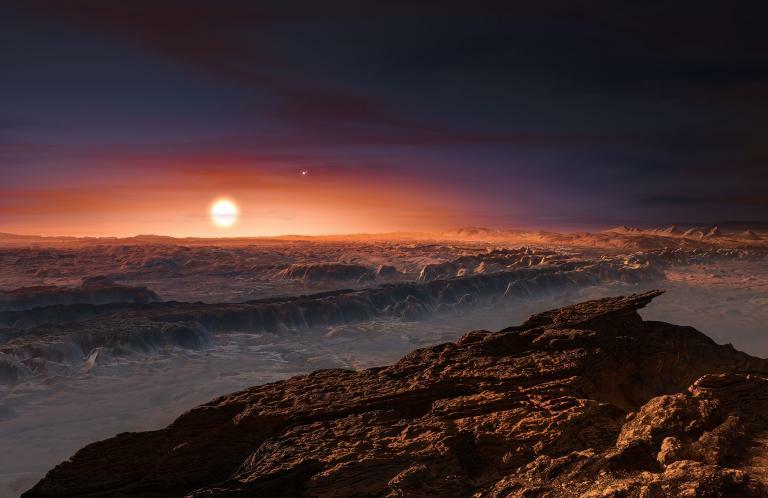 Artist’s depiction of Proxima Centauri b’s surface. Our closest existing exoplanet, Proxima Centauri b, orbits the star Proxima Centauri, a faint red dwarf approximately 4.24 light years away. In our galactic neighborhood, it’s just the next apartment unit over. 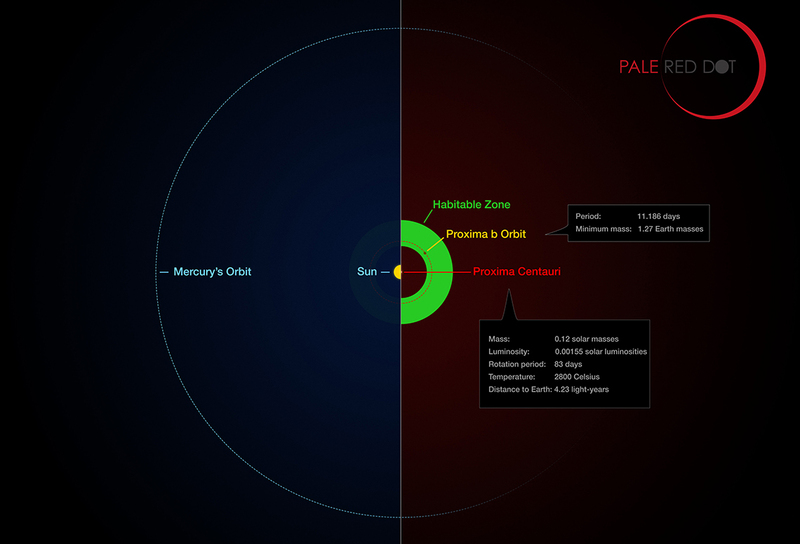 Speaking of living quarters, Proxima Centauri b is located within its host star’s habitable zone-or “Goldilocks” zone. Not only is the exoplanet orbiting in the zone where liquid water may be possible on the planetary surface, but it’s also merely 1.3 times the size of Earth. Proxima Centauri completes one orbit around its host star every 11.2 days and almost certainly terrestrial. All leads to one wondrous thought. We have located a planet like Earth orbiting the closest star to our Sun, and it may even sustain life. Allow me to be poetic. This is absolutely freaking awesome, achieving maximum wow factor. From Proxima Centauri b to its host star measures only one-fifth the distance compared to Mercury’s relative position from the Sun. It orbits much nearer to its star than Earth, exactly 7.3 million kilometers in comparison to Earth’s 150 million kilometers. However, the planet’s star has a diameter of only 124,274 miles (200,000 km). To put this into perspective, the red dwarf measures only 1.43 times the diameter of Jupiter. Proxima Centauri is a very cold star in comparison to our Sun, typical of a red dwarf. This type of star is thought as the most abundant within our galaxy. To compensate for the smaller size and colder surface, the planetary habitable zone wraps tightly around the star. Proxima Centauri orbits two other stars which are a part of a binary system known as Alpha Centauri. This system, including Proxima Centauri, in entirety is referred to as a triple-or “trinary”- star system. 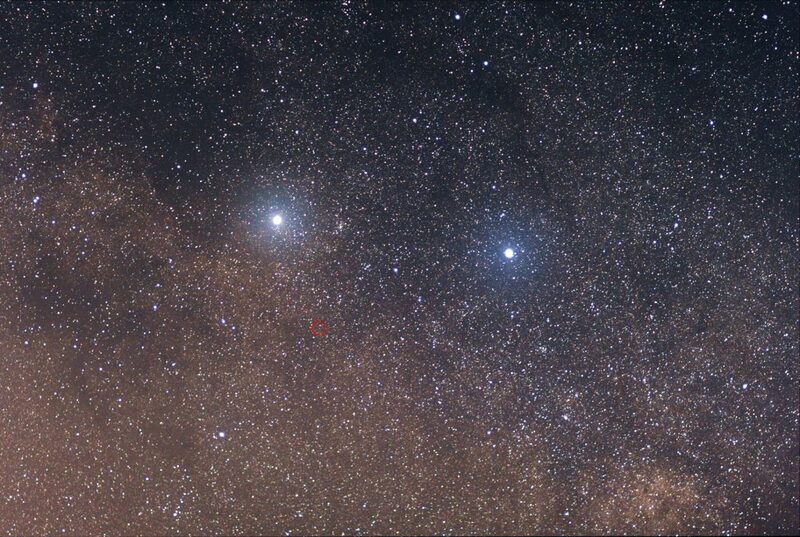 Positioned 0.1 light years from its two big sister stars, Alpha Centauri a and Alpha Centauri b, Proxima Centauri is the runt of the liter and difficult to see in the night sky. Proxima Centauri b was discovered by scientists working on the Pale Red Dot project, a reference that stems from Carl Sagan referring to Earth as a pale blue dot from space. 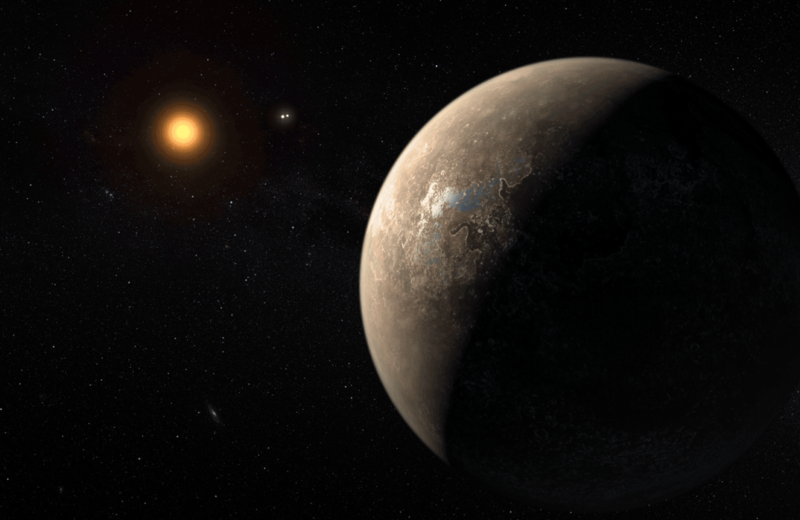 Hints at the existence of an Earth-sized planet around Proxima Centauri were speculated as early as 2000. Determined to find out, the researchers on the Pale Red Dot project used the High Accuracy Radial velocity Planet Searcher (HARPS) at the European Southern Observatory in Chile to track Proxima Centauri’s orbit earlier this year. And now look at what we know. Knowing the closest possible exoplanet in existence could nurture life overwhelms and awes my imagination. I feel as if I’m describing what was once mere science fiction, capturing the transit from one era to the next. Although easy to get swept away in the magic of this discovery, we must examine more than the possibilities which appeal greatest to our dreams. Like any theory, alternative angles must be considered in order to open our minds to all possibilities. Consider the two other planets within the Sun’s habitable zone, Venus and Mars. To live on Venus would be nothing short of an absolute nightmare. Bombardment from the solar wind’s supercharged particles and other stellar events caused lighter elements and bodies of liquid on the planet to evaporate into space, replaced by heavier oxygen atoms which bonded with carbon. We can see less drastic variations of these effects on Earth through self-destructive carbon emission into the atmosphere. Global warming has increased Earth’s surface temperatures. Venus should serve as a permanent reminder of what could be our future. The planet’s intense smog allows for suffocating 872 degrees Fahrenheit (467 degrees Celsius) surface temperature. Chew on this: lead would melt on Venus. With our current technology, if one were to stand on Proxima Centauri b- and maybe someone, or something, is at this very moment- and study our solar system, results would indicate not one, not two, but three planets orbiting within our Sun’s habitable zone. This highlights one important disclaimer: just because a planet orbits within the habitable zone of a star does not mean it itself can sustain life. Good news! No evidence can discount the possibility that even something as incredible as a form of humanity lives on Proxima Centauri b. Bad news! Technology can’t keep up with our discoveries and dreams. Don’t pack your bags for interstellar travel yet. It would take thousands of years in the fastest currently modeled spacecraft to reach our neighboring exoplanet. Regardless, this discovery propels engineers to continue testing new forms of advanced spaceflight. It certainly is plausible for us to begin a mission to Proxima Centauri b within the next century. Humanity centers around companionship. As a principle way of life, it fosters our dreams to one-day reach our sister planet: possibly a New Eden. alien, Astronomy, discovery, Earth 2.0, earth proxima, Exoplanet, New Earth, news, planet, Proxima centauri, Proxima Centauri b, Proxima Centauri Planet, spaceflight, stars. Bookmark.